Stella Cherry This tree is an ‘Idaho Preferred’ Plant. Stella Cherry is a must for the home gardener with limited space. 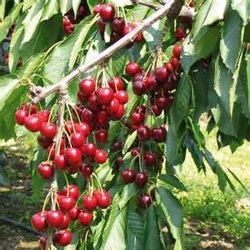 This semi-dwarf cherry tree produces large, dark-red fruit that is firm and sweet. It has delicious fruit that is resistant to cracking. This tree is small and compact, bears at a young age, and is self-fertile. The fruit ripens in late July, early August. Fruit trees attract wildlife, birds, and bees. They are good for fresh eating, making jams, jellies, sauces, and pies. Stella Cherry likes to be planted in full sun.